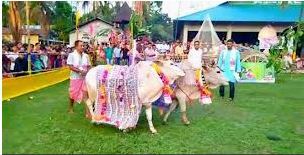 STORY: People of Barpeta district of northeastern India’s Assam state, celebrated the first day of the arrival of their traditional New Year on Monday (April 15), with a cow fashion show. Cows, revered as a sacred animal in the Hindu belief system, have also been an integral part of the majority agriculture-based culture of India. The celebrations of Assamese New Year, ‘Bohag Bihu’ are spanned over seven days and the first day is ‘Goru Bihu’ dedicated to cows. The cows were adorned with accessories, flowers, and colourful clothing before walking on what looked like a grass ramp, amid cheers from visitors. In neighbouring Siliguri, people came together, dressed up in traditional attires, to celebrate the Bengali New Year as well. The celebrations were marked by worship, folk dancing, and singing.